Not to be confused with Jurassic period. The coat of arms of the canton of Jura is an irredentist design dating to 1943; it shows per pale the crozier of the historical coat of arms of the bishops of Basel, and seven stripes for the seven districts of the Jura region, including the four districts that still remain part of the Bernese Jura. Jurassic separatism (séparatisme jurassien) is a regionalist independence movement in the Bernese Jura in Switzerland. The "Jurassic question" (question jurassienne; Jurafrage) is the question of secession of the Jura region from Berne, implemented partially as three of seven districts formed the Canton of Jura in 1979, while the remaining four opted to remain with Berne. 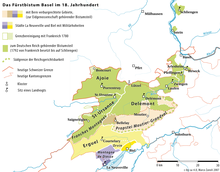 Historically, the conflict originates with the Congress of Vienna (1815), where the Jurassic territories of the Prince-Bishopric of Basel were given to Berne. The "Jurassic question" was a topic in Swiss politics between 1947 and 1974. In 1947, a separatist Comité de Moutier was formed. By 1949, the separatist movement was officially constituted as the Rassemblement jurassien. In 1952, the opposing anti-separatist side was constituted as the Union des patriotes jurassiens (UPJ). A group of militant young separatists known as the Béliers ("rams") was formed in 1963, which by 1973 received its anti-separatist counterpart in the group Sangliers ("wild boars"). The cantonal government of Berne formed an official commission charged with the resolution of the conflict in 1967. On 23 June 1974, a cantonal poll was held resulting in the decision to form a new canton of Jura. In a second poll of 16 March 1975, the three districts of Delémont, Porrentruy and Franches-Montagnes opted to secede, while the four districts of Courtelary, La Neuveville, Moutier and Laufon voted in favour of remaining with Berne. In 1977, the population of what was going to be the new canton ratified the cantonal constitution. Finally, the population of Switzerland in a national referendum accepted the accession of the new canton to the Swiss Confederacy with an 82.3% majority, and the new canton was officially created on 1 January 1979. Laufon was now a Bernese exclave, wedged between the new canton, Solothurn and Basel-Landschaft. In a 1980 vote, the population of Laufon voted to join Basel-Landschaft, and after a transitional period the move was effected in 1994. The three Bernese districts of Courtelary, La Neuveville and Moutier were united as the single district Jura bernois in 2001. With the creation of the canton of Jura, militant activism declined, but there remained a politically active irredentist movement in the Bernese Jura. In particular, the municipality of Vellerat found itself in the canton of Berne, but it could only be reached via roads from the canton of Jura. Vellerat proclaimed itself a "free municipality" and campaigned to join the new canton, which it eventually did in 1996. The Béliers continued to engage in acts of vandalism to express their outrage at what they claimed were irregularities in the plebiscites of 1974 and 1975, among other things stealing the Unspunnen Stone in 1984, and destroying the historic "Fountain of Justice" statue in Berne in 1986. In 1994, the Mouvement autonomiste jurassien (MAJ) was formed from a fusion of the Rassemblement jurassien (RJ) and the Unité jurassienne (UJ) groups. Another separatist group is Mouvement Indépendantiste Jurassien (MIJ), formed in 1990. Due to the remaining separatist faction in Moutier, another poll was held in 1998, but the district again decided to remain Bernese. But in 2006, the autonomist parties gained a majority in the regional elections. In the same year, a Conseil du Jura bernois was formed, the only example of a regional parliament in Switzerland. A new suggestion was published in 2007 by the Assemblée InterJurassienne (AIJ), to the effect that two "half-cantons" should be formed from the existing canton of Jura and the Bernese Jura. ^ Voutat, Bernard (23 September 2010). "Jura bernois". Dictionnaire historique de la Suisse (in French). Retrieved 13 June 2012. ^ "Assemble Interjurassienne". Assemble Interjurassienne (in French). John Robert Graham Jenkins, Jura separatism in Switzerland, Clarendon Press, 1986, ISBN 978-0-19-823247-6. Michel Bassand, Le séparatisme jurassien, International Political Science Association, 1973. Adolf Gasser, Berne et le Jura (1815-1977), 1978. Claude Hauser, Aux origines intellectuelles de la question jurassienne : culture et politique entre la France et la Suisse romande (1910-1950), Editions Communication jurassienne et européenne (CEJ), 1997. Alain Pichard, La Question jurassienne : avant et après la création du 23e canton suisse, collection "Le savoir suisse", vol. 16, Presses polytechniques et universitaires romandes, 2004. ISBN 2-88074-575-6. This page was last edited on 27 May 2018, at 21:41 (UTC).